This month Royal Wolf was excited to be a part of Gourmet Cinema Melbourne – a giant outdoor film and food experience held at Caulfield Racecourse. Now in its second year, the event brings together Melbourne’s best restaurants with crowd-pleasing flicks across the two weekends. 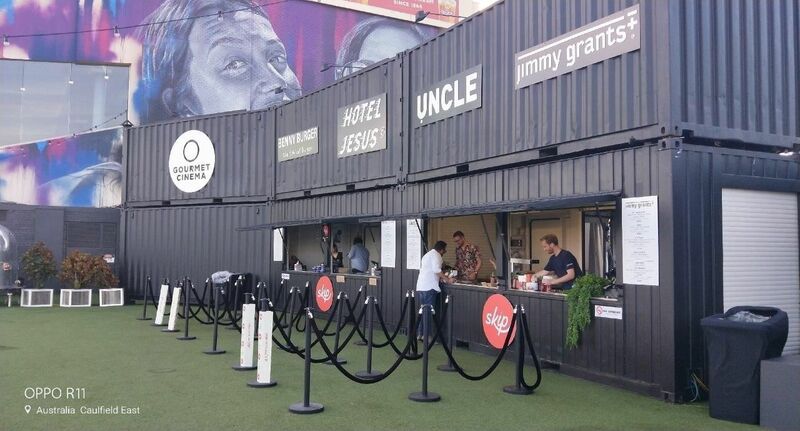 Royal Wolf provided two 20ft Pop-Up Container Shops and four event refrigeration units which were transformed into seven restaurants alternating over eight nights - Hotel Jesus, Jimmy Grants, Hellenic Republic, Uncle, Benny Burger, Mamasita, and Sideways. The screenings were catered by a different restaurant every night, with each menu taking inspiration from the film showing that evening. Alicia McPhillips, Business Development Executive at Royal Wolf, said that Gourmet Cinema was an exciting project that showed off the endless possibilities of their off-the-shelf solutions. 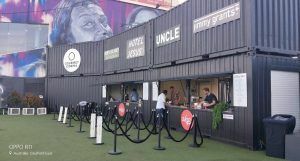 “The Gourmet Cinema project was a lot of fun for the Royal Wolf team – we love seeing our containers transformed into creative and exciting venues. Our pop-up products are a low-cost, versatile way to accommodate a growing business or bring an event or festival to life with food and drink,” said Alicia. The 20ft Pop-Up Container Shops are conveniently designed with security doors, laminated bench top, power, lighting and sink unit. They are built from steel containers with heavy-duty marine grade flooring and cold room panel ceilings, offering outstanding security features including a high security steel side access door. To ensure the pop-up food stalls had all the amenities a restaurant requires during the event, Royal Wolf also supplied refrigerated units - a reliable event staple which features precise temperature control between the ranges of 20°C and -20°C, efficient internal lighting and has among the lowest power consumption available on the market. Gourmet Cinema was a great success, drawing a huge crowd of foodies and film buffs who enjoyed a favourite pastime in an unexpected place - with Royal Wolf’s pop-ups and refrigerators keeping the event lively with great food and atmosphere.